حروف الجر زى to, in, from, into .... تستخدم بكثره بس فى بعض الحالات لا نستخدم فيها حروف الجر دي ، اليكم خمس حالات. 📝 خلى بالك (.no ) او ( # ) هي اختصار ل number . 🌼 غالباً بعد " go " نستخدم ⬅️ to + place( المكان). ◾️I’m going to the mall. ◾️We went to Paris last year. 🚩ولكن اذا كان هذا المكان home or downtown ⬅️ لا نستخدم " to "
◾️We went downtown last night. افتكر اغنيه إن أون آت شهور ايام ساعات . ◾️I have a meeting on Friday. ◾️The concert is in June. yesterday, tomorrow, this, last, next. ◾️I have a meeting tomorrow. ◾️We’ll call you next Friday. ◾️The concert is this June. 🌼عادة بنستخدم " into " للتعبير عن الحركة من الخارج إلى الداخل. ◾️She came into my room. ◾️Let’s go into the house. 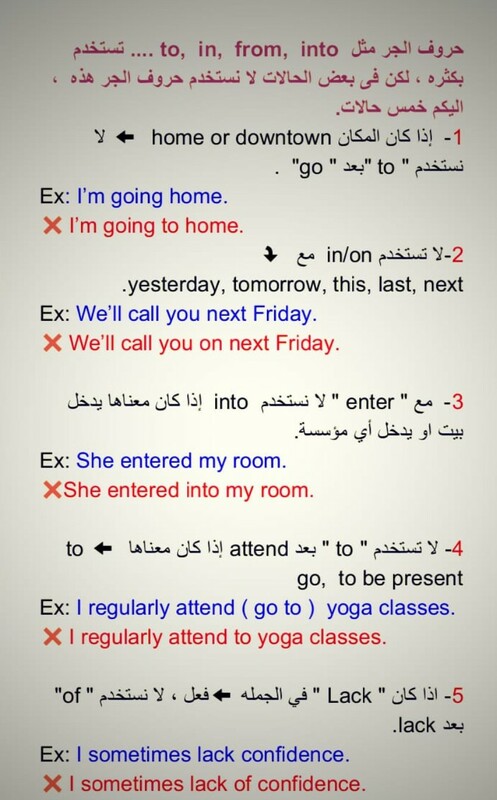 🚩 ولكن مع " enter " لا نستخدم into . 🔔 " Enter into" ➡️ is only used for starting agreements, negotiations, discussions, etc. بس خلى بالك بنستخدم Enter into فقط لما نحب نبدأ الحديث عن اتفاقات، مفاوضات، مناقشات، الخ. ◾️The two companies entered into a financial agreement. ◾️Spain and France will enter into trade negotiations next month. ◾️Nine students attended (go to) the lecture. ◾️I regularly attend ( go to ) yoga classes. 🔔"Attend to" ➡️ means to pay attention to or handle something. خلى بالك attend to بمعنى يعتني بي او يتعامل مع . ◾️Doctors attended to the people who were injured in the accident. ◾️We’ll attend to that problem later. 🚩 اذا كان " Lack " في الجمله ⬅️فعل ، لا نستخدم " of" بعد lack. ◾️Last night’s dinner lacked salt. 🚩 اذا كان " Lack " في الجمله ⬅️اسم ، نستخدم " of" بعد lack. ◾️I’m trying to overcome my lack of confidence. ◾️The lack of salt made the food tasteless.